Cost: None. Donations (dana) will be appreciated. Please bring your cups, teabags and snacks to share. Beyond resistance, what will it take to build a nonviolent mass movement to change the systems and policies that are bringing us ever-closer to the cliff of climate chaos, unending corporate power, and ceaseless assaults on already marginalized communities? Morgan Curtis and Daniel Jubelirer are youth climate justice activists who first worked together in Paris during the UN Climate Talks, and have since been involved in a variety of campaigns, including supporting youth who are suing President Trump for violating their constitutional rights to a stable climate capable of sustaining human life. Together, they will weave stories and lessons from their journeys, including reflections on the critical role spiritual practice plays in social change, which Morgan has explored as a Spiritual Ecology Fellow with Kalliopeia Foundation. Daniel will also share his thesis research from the Peace Studies program of Naropa University, where he has been researching how social movements can reach their full potential, and how movements can sustain action over the long-term. There is a craft to uprising, time-tested methods and approaches to build momentum for systemic change. 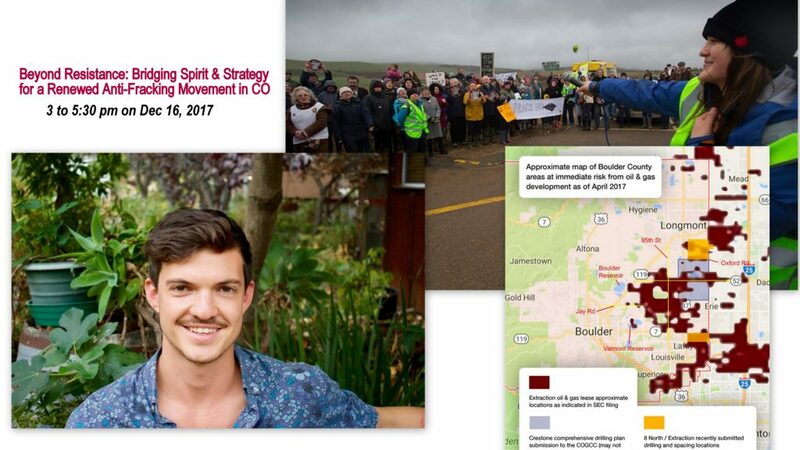 He will share some key principles to effective movement building, and together will current leaders of anti-fracking movement in Boulder county, we will open a discussion on how to best apply this research to the fracking fight in Colorado. Lastly, we will contemplate risk – how far are we willing to go as spiritual activists? Morgan Curtis works at the intersection of sustainable community-building and political mobilization, where she strives to understand how stories shape human relationships, resilience, and revolutions. Morgan’s work in the youth climate justice sphere was born from the fossil fuel divestment movement, and matured by way of Climate Journey: a six-month bicycle journey gathering stories from grassroots climate activists in eleven countries en route to COP21. After organizing against fracking on her home island in the UK, Morgan returned to the United Nations to lead the SustainUS COP22 delegation, experimenting with ceremony and storytelling inside those halls of power. A resident of Canticle Farm, an intentional community based on the Work That Reconnects in Oakland, CA, Morgan is passionate about resourcing youth activists with the love, shelter, skills training, and courage needed to take action on a scale commensurate with the crisis. Daniel Jubelirer believes that a world that works for all people is possible. With East Coast roots in North Carolina, and West Coast fruits in the Bay Area of California, he is currently a Peace Studies student at Naropa University in Colorado studying social movements and nonviolence. His Senior Thesis is exploring how social movements today can realize their full potential. He has worn the hats of community organizer, educator, facilitator, artist and scholar primarily within the youth climate justice movement, and attended the COP22 Climate Talks as a delegate with SustainUS. He co-founded Tufts Climate Action, running a fossil fuel divestment campaign for two years, is a trainer with Generation Waking Up, and supports the Generation RYSE Youth Council with Earth Guardians. A student of Joanna Macy, Daniel is honored to be a facilitator of the Work that Reconnects.